If you’ve been to the SRC on a busy afternoon, you’ll know the frustration of looking at the sign-up sheets for the cardio equipment only to find that all of the treadmills, ellipticals, and stationary bikes are all booked up for the next half hour. However, on almost any given day at any given time, when you’re about to give upon getting your cardio workout, you can guarantee that one piece of gym machinery will be wide open: the rowing machines. I’m honestly not sure if this is because the majority of regular gym-goers at the SRC don’t know how to use them, or if the majority of people just hate using them, but proper use of a rowing machine will target all major muscle groups in your body while simultaneously giving you a great cardiovascular workout! 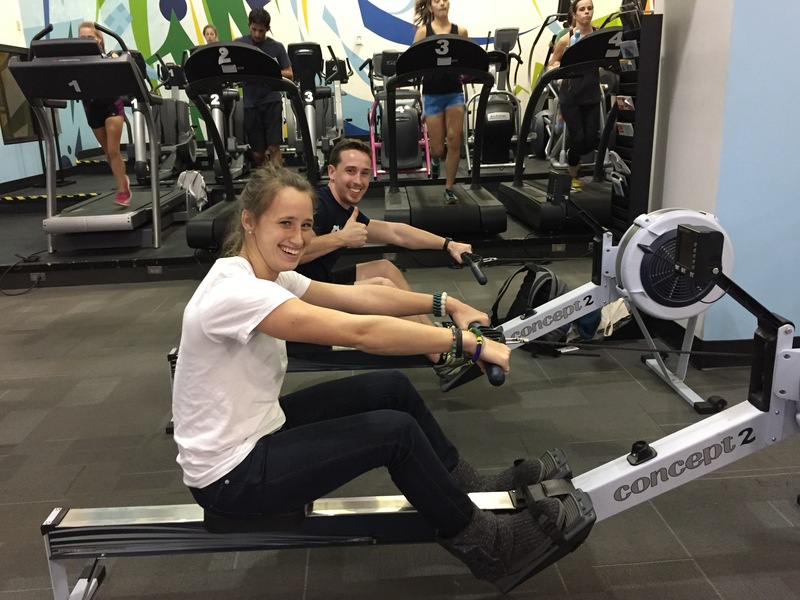 Here are the steps of how to properly use an indoor rower to achieve the smooth rowing stroke pattern that will eliminate unnecessary muscular strain, provide a great full-body workout, and save you the frustration of waiting for an elliptical next time you visit the SRC! You’ll want to adjust the resistance. 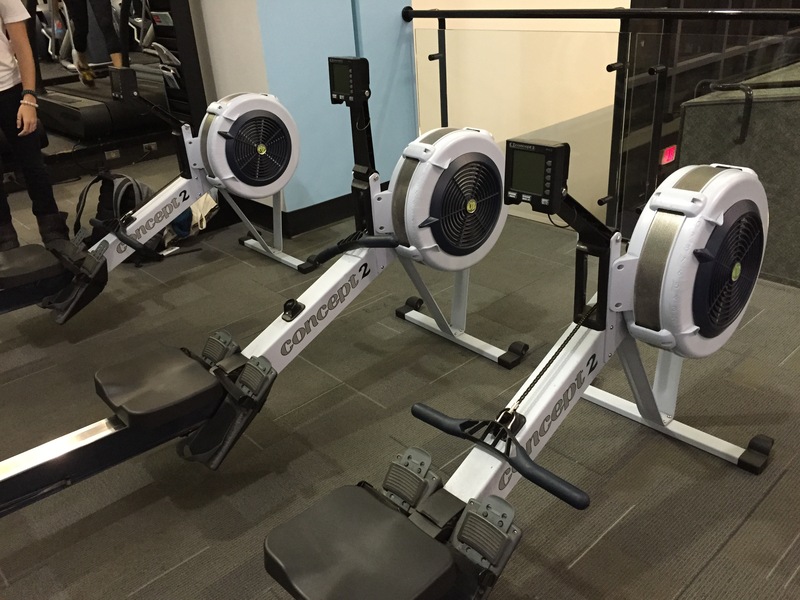 The round part in the front of the rowing machine that looks similar to a fan is called the flywheel. Adjusting the dial on the flywheel is what determines the resistance that the machine will provide for your workout. Don’t start with the resistance too high or you won’t be able to maintain a smooth stroke pattern for more than a couple of minutes, as exhaustion tends to lead to bad form. 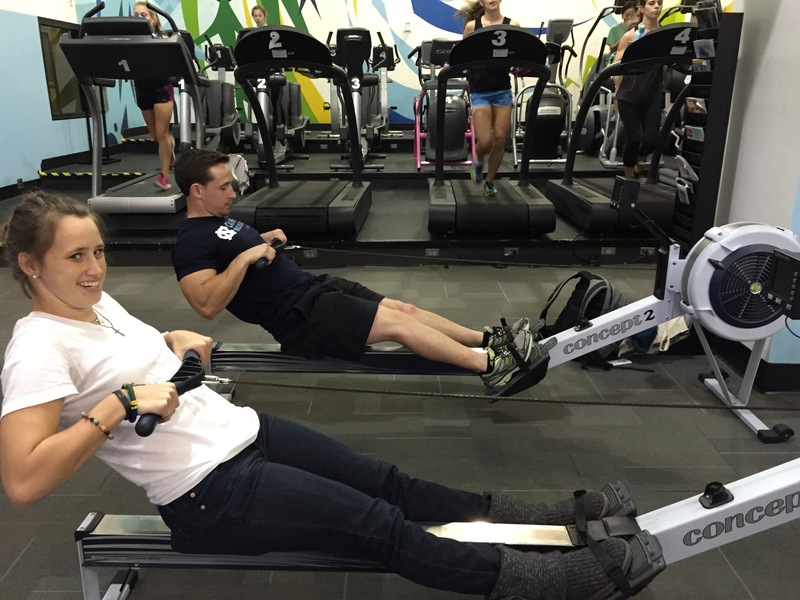 Sit down at the rowing machine and adjust the foot-holders. You can adjust the length of the foot holder and then tighten down the strap that goes over your shoe to keep your feet in place. Now grasp the handle and keep your elbows in toward your ribcage and try your best to check in and make sure those elbows are staying close to your body and not sticking out to the side throughout the entire workout. Find the position where the cord “catches.” Sit with your knees very bent and your bum should still be pretty close to your heels. Slowly start to lean back and let your knees relax their bend a little until your reach the point where you feel that the cord attached to the handle “catches” and suddenly you can feel that it will now take more effort to pull the cord out further. The cord should be taunt and not floppy or loose at the catch point. Keeping your arms and back straight and elbows close in the position that they were previously, start by pushing your feet against the footpads and using your leg muscles to start the stroke. Once your legs are entirely extended, the handle should be a little higher than your bellybutton but still should not be pulled back against your body. Now that your legs are straight, you’ll transition to using your arm muscles to pull the handle toward you and slightly upwards as you lean back a bit. Thus the power of your stroke comes first from the legs, secondly from the arms, and lastly from the core as you lean back slightly to extend the stroke even further and simulate bringing the oar upward and out of the water, as you would be doing in a real boat. The elbows should still be in toward your ribcage! Your rowing pattern on the ergometers should be long and fluid and should never be wild, loud, or jerky. Do not just sit down, grab the handles, and immediately start using your legs to power yourself backward as fast as possible. Doing this will cause you to reach the catch point in the middle of the stroke, which will cause the machine to be loud instead of the quiet whirring you should hear, and will also cause a big jerk forward in your stroke as you rapidly go from the cord being loose to being taunt and having resistance. Doing so will hurt your shoulder and back muscles and you’ll also look silly. While you’re using the machine, remember that you’re supposed to be simulating using two oars to row a boat. If the way you’re rowing would cause a ridiculous amount of splashing in a boat, you need to stop, reset, and consciously go for long strokes that would glide smoothly through the water. Now that you’ve driven through the backwards drive of the stroke, you’ll release your stroke back to the starting position to complete the cycle. This should happen in basically the opposite order of your backwards drive: release the arms away from the body and out straight in front of you, then lean the torso back slightly forward, and finally bend your knees to slide forward on the gliding seat. Do not release your stroke faster than the flywheel can roll the cord back in. Doing so means that you are achieving no resistance or work in the release part of your stroke and are therefore missing half of the workout potential. Once you’ve gotten back to the starting point and your bum is once again close to your feet, you’ll return back to the catch point and start the next stroke! Tada! 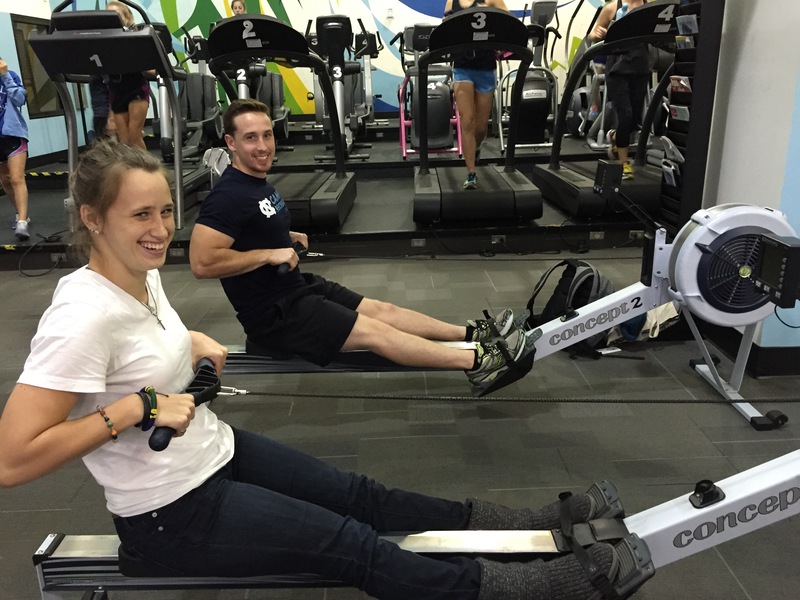 Now you know how to use an ergometer like a pro next time you hit the gym and you can look forward to experiencing a new type of workout! You can also use the little screen of the ergometer to keep track of your distance, speed, time, estimated caloric expenditure, and other measures. Distance and time are good measurements to use to plan your own workouts, so start out small rowing 300-500 meters at a time, for example, and then take a break or row slowly in between sets. Then you can slowly work your way up in distance or time without taking breaks. 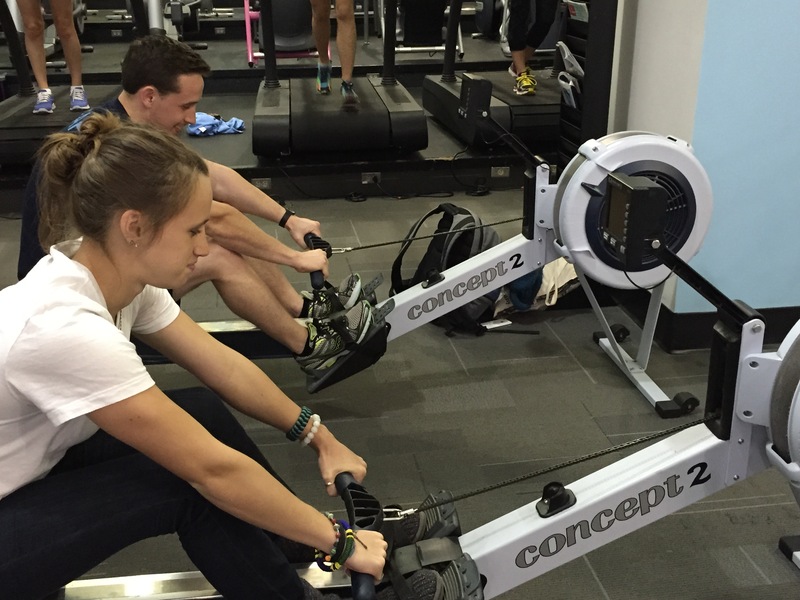 When I rowed for the first time, I quickly discovered that it was much more exhausting than I expected, so it took me a while to work my way up to even be able to do ten minutes at a good speed without stopping. I would also suggest checking out a towel from the SRC in case your palms start to feel like you’re going to get blisters, so that you can wrap the towel around the handle to prevent that from happening! The ergometers in the SRC also have a setting called “fish game,” where you are a “fish” on the screen and other big and small fish are coming at you. Rowing faster moves your fish upward, and slowing down makes your fish fall toward the bottom of the screen, so you adjust your speed to eat the small fish coming at you for points and avoid the big fish coming at you, which will make you lose points! I think it’s pretty fun if you’re not in an intense interval-training mood, but I feel like people might be wondering why I’m changing my speed so much the whole time. 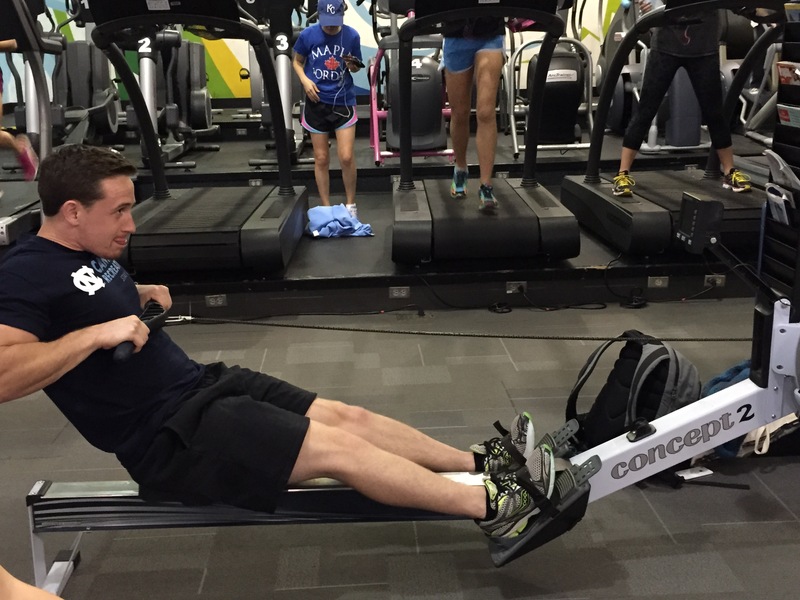 All credit goes to my friend Jesse, who rowed with the varsity team here for a few years and taught me how to use this thing when I was tired of waiting for a stationary bike over a year ago! Also, thanks to the rowing models, who helped me with the pictures with no warning whatsoever—you’re great!